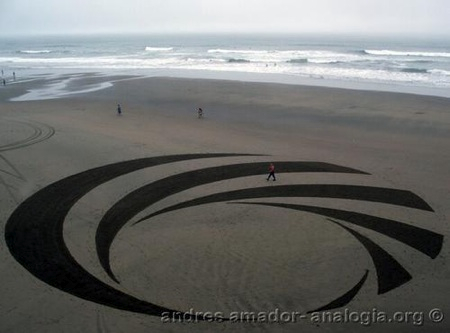 Andres Amador is a San Francisco-based artist who specializes in movement and light sculptures. 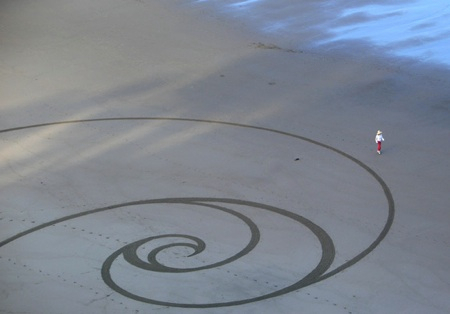 Amador is pioneering a new art genre: crop circles in sand. They are quick, temporary, cheap, spectacular, and fun. And anyone can make them. You can roughly see how the patterns are produced in this very low-res video. Andres first uses ropes to sketch out the outines of the dark sections. 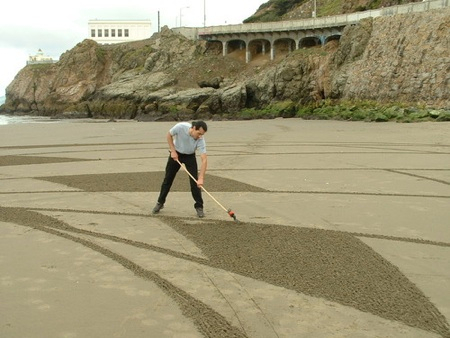 He then returns to those guidelines and uses a rake to rough up the sand within those lines in order to make the pattern. He describes his process on his website, Analogic, where all these images come from. 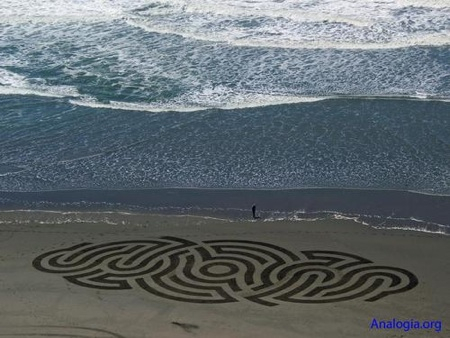 The designs are large images etched into the beach. So far these have all been done beneathe Sutro Heights on Ocean Beach in San Francisco. The location was strategic so I could take pictures. How do I do it? Basically I simply rake the surface of the beach to expose the wetter, and therefore darker, sand below. I can’t think of art more environmentally friendly, aside from the work of Andy Goldsworthy, who is definitely an inspiration. My materials consist of rope, stakes and a rake. Geometry (which I was not a whiz at in high school) determines the rest. It’s all about creating patterns and then decided which aspects to highlight. Creating the patterns is the easy part, the art comes in when deciding what gets shaded. This began innocently enough with a fascination with crop circle designs, especially the ones coming out in recent years. I was in Kauai, soaking up the sun on the beach at Kalulau Valley, when I used my walking stick to illustrate concepts about Sacred Geometry that I had been learning. 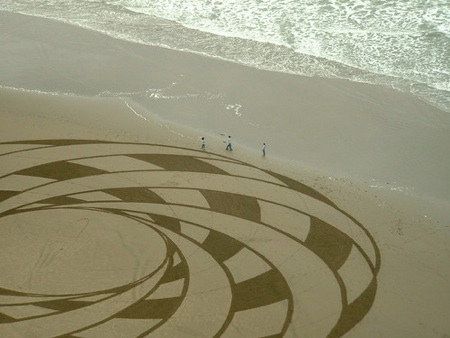 Earlier, in San Francisco, I had been doing crop circle reconstructions on computer using Illustrator. Reconstructions are a person’s reverse engineering of circle designs. As I was making a few circles, showing basic concepts of sacred geometry, the obviousness of the two artforms came together. Suddenly the possibilities hit me. Hawaii was a poor place for circles due to the short, steep shorelines. Strangely enough, there I was in paradise and I couldn’t wait to get back to the beaches of San Francisco! I was salivating over the broad open expanse, the long shallow beaches, the canvases awaiting me. Imagine- going to Hawaii to learn how much I love SF beaches (for as dirty and crowded as they can be)!As soon as I returned home I took my pal in psychedelic crime, Kris Northern (aka Phidelity) out to show him what I had ‘discovered’. I soon made a believer out of him. The designs are easily developed and executed. There is no cost involved and brings me to Ocean Beach, a place that in all my years prior I had visited perhaps a handful of times. It is a relaxing pursuit with practically instant, and beautiful, gratification. The credit loans are very useful for guys, which want to start their career. In fact, it is easy to receive a sba loan. how is it possible for an artist to make this if it is in fact mathmatically correct, without aid of mechanical devices??? ?